When the BBC announced they were reviving Robot Wars after twelve years away from our screens I was a little surprised to say the least. My shock came from the fact that I always found it to be quite a niche show to the extent that I was surprised that it lasted as long as it did. I was surprised further to learn that the programme that was synonymous with early weekday evenings was being promoted to prime time on Sunday nights. Although I was never a fan of the show myself I do have brief recollections of various family members watching the show as host Craig Charles' excitement burst out of the TV. Additionally I remember several of the house robots namely Matilda and Sir Kill-a-Lot who both return albeit in an updated fashion. As part of Robot Wars' charm is that it harkens back to a simpler time we've decided to go all nostalgic with this review as we present in a style that those familiar with the old layout of the website will remember very well. * The focus on the teams behind the robots: Probably my favourite thing about this entire episode of Robot Wars was the way in which it displayed British eccentrics. Rather than being ridiculed the men, and handful of women, behind these battling bots were celebrated for their creation of this inventive creatures. My favourite were the team of quirky hat-wearing engineers behind the robot known as Nuts whose name was obviously inspired by the description that I'm sure is often attributed to its creators. * Dara Ó Briain: After the high octane presenting style employed both Jeremy Clarkson and Craig Charles in the original incarnation of Robot Wars it was good to see the Irish comic employ a more laid back approach. Ó Briain appeared to be incredibly interested in the creation of the robots and his enthusiasm for the various wars throughout the episode was infectious. * An Easy-to-Understand Format: I'm actually astounded by the number of game shows whose layout is ridiculously complicated with rules-upon-rules spoiling what should be a fun viewing experience. Robot Wars round robin system was easy to digest and therefore we knew what was going on at all times. 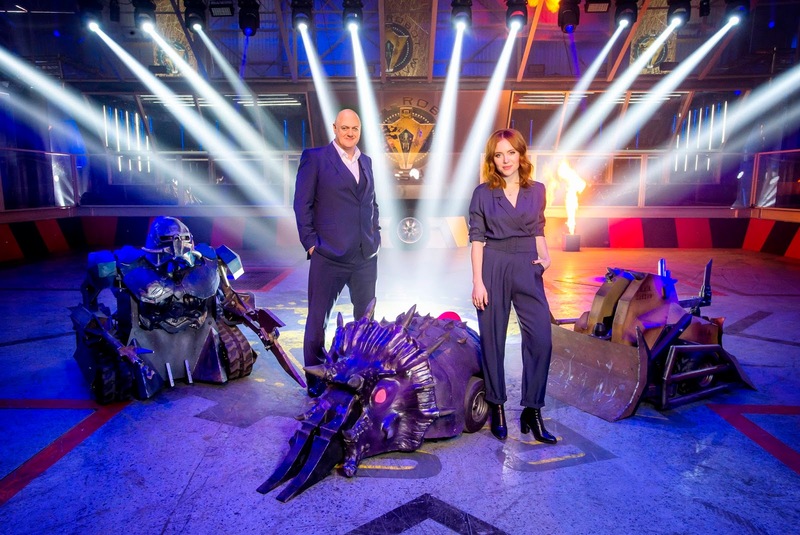 * Jonathan Pearce: Robot Wars just wouldn't be the same without this veteran commentator who adds an enthusiasm to the action which we felt was lacking elsewhere. * The House Robots: Adding to the nostalgic elements of the show were the returns of Robot Wars' original stars Matilda, Shunt, Dead Metal and Sir Killalot. The fact they've been updated for this new series is in keeping with the fact that a lot of the new robots coming into the arena are a lot more advanced than the ones we saw in the show's early days. * The Running Time: The majority of episodes from the original series ran from about thirty to forty-five minutes which to me is the perfect fit for a show such as this. An hour-long running time means that there is a lot of unnecessary padding whilst the round robin element of the contest seemed to be never-ending. * Angela Scanlon: Whilst we didn't think Scanlon was bad as a co-host we do feel she was mistreated and just handed the odd interview here and there. Scanlon's role on this reminded me of the part Rochelle Humes plays on Ninja Warrior UK namely that of the token woman who just hangs around and interviews a couple of the winners and losers. * A Lack of Variety: This is mainly personal opinion but we didn't feel much was done to differentiate between the early battles and the show's finale. We would've like some extra challenges in the later rounds as we felt the energy of the programme petered out around halfway through the episode. After having watched the first episode it's clear that the main audience for this Robot Wars reboot are the people that loved its original incarnation. The fact that the structure is almost identical, bar the new presenters, means that fans of the original will love this. But I don't think that the new series will appeal to Robot Wars novices like ourselves as it feels overlong and quite repetitive. That being said we did like the fact that it promoted the Great British eccentrics that don't feature on TV as much as they should do and maybe there should be more shows in a similar vein to Robot Wars that let their geek flag fly high. Thanks. I didn't realise Dara was presenting it. He's good. I might have to check it out. Didn't Robert Llewelyn (Kryton) used to present it?